Takeru started Karate in early grade school after being inspired by K-1 which was airing on TV. He made his transition to kickboxing in high school and showed great potential. After competing in several amateur events, training in Thailand, he entered the Junior K-1 series. After graduating high school, he joined Team Dragon where current K-1 producer runs, and made his debut in 2011. Takeru continued to deny the negative rumors toward light weights by becoming a KO artist, and becoming Krush-58kg Champion in 2013. 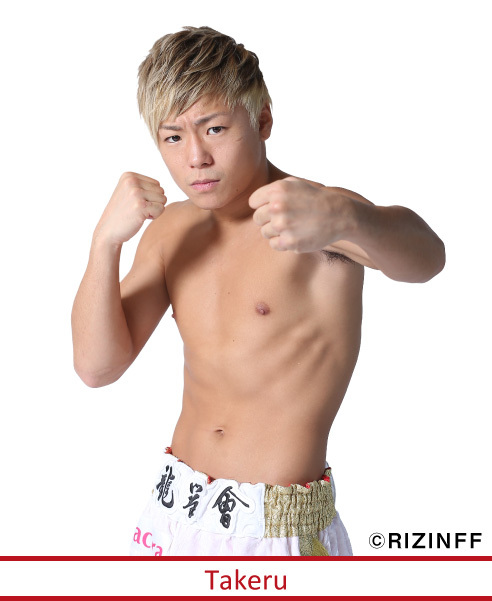 He entered the K-1 WORLD GP 2015 -55kg division and advanced to the finals with 2 KO victories where he fought a great battle with Taiga to become the -55kg champion. He defended his title in November and has been actively self-promoting himself and K-1 through various media outlets. This young fighter is eager to showcase his skills on the biggest platform of his career.